Guest Post Series: Faces of Spring, Linda from "Silverkis"
I am Linda from Silverkis.com, and I’m very honored to be able to write this guest post for you today! Sara and I share a lot of things in common, the first time we got chatting, she impressed me by how in-tuned she is to Asian makeup trends. Myself, I spent a good part of my youth living in the US, and in some ways I find myself more Western-minded when it comes to makeup. So the big question that I’ve always been trying to answer, is how to marry the best of East and West. For today, I thought it’d be fun to give you a glimpse at some of my personal favorites from this past Spring 2015 collections, and explain them in the context of “Asian” beauty, with the hopes that it will give you a greater appreciation for some of these new trends that are gaining popularity. The Asian ideal of beauty revolves around a flawless porcelain complexion, and more often than not, is obsessed with perfection and fair. In contrast, Western consumers favor some color and the ability for natural beauty to shine through. Two very contrasting concepts, but somewhere in between there exists a perfect middle ground, and I think an excellent example is the Diorsnow Les Neiges Rainbow Powder. Every year Dior releases an Asia-exclusive collection in Spring, and it usually includes a face powder of some sort. This year's Rainbow powder was exceptional not only for the beautiful mosaic pattern, but for its ability to veil imperfections while allowing the natural skin to still show through. It floats over the skin without any cakiness or powderiness, is mostly invisible to the eye but still manages to blur the look of pores and brighten the overall complexion. Very few finishing powders impress me as much as Guerlain Meteorites Pearls, but this Diorsnow Rainbow Powder may yet surpass that, and comes in a much more travel-friendly lightweight compact! The Diorsnow collection is expected to be available in the US around summer, so do watch out for this one. 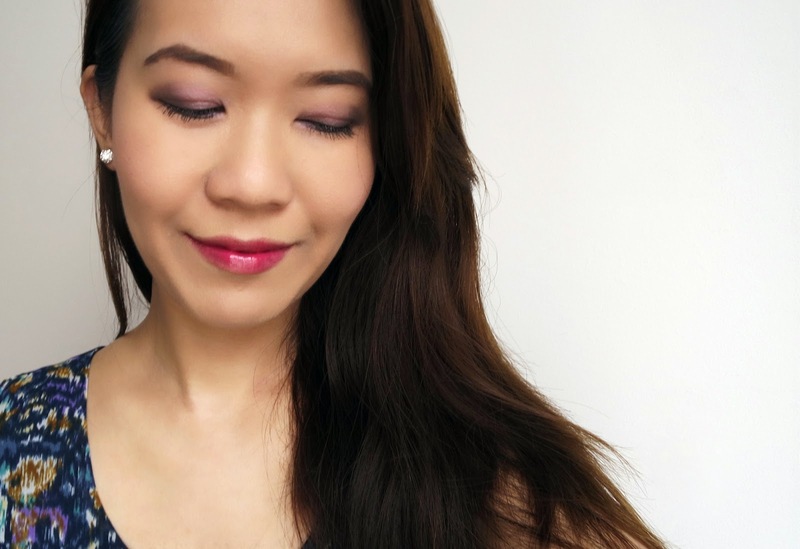 Spring eyeshadows are generally not my favorite as they tend to be pale and pastey, and it is even worse out here in Asia as the current prevailing trend from Korea features minimal eye makeup. But this season I was pleasantly surprised by the somewhat bolder and smokier eye makeup presented by many Western brands. Whilst I personally thought Tom Ford’s rocker chic inspiration was insanely cool and irreverant for Spring, Chanel struck the best balance between pretty pastels and smoky with its La Perle de Chanel collection. Just like Dior, Chanel typically releases a special collection for the Asian market in Spring, but this year, this collection was also made available on Chanel.com and is also expected to be available at Nordstrom for their annual summer sale. I particularly loved the Les 4 Ombres Eyeshadow Quad in Tisse Rhapsodie which replaced classic black/grey/brown with a cool complex charcoal for some extra definition. Addiction is a Japanese makeup brand that was founded by makeup artist Ayako, who was mentored by Francois Nars in New York for many years. Unfortunately it is not easily accessible outside of Japan, but you may find it on various online retailers specializing in Japanese cosmetics. There were 2 new Blush Mix from the latest Spring collection and I picked up Pink Waves on a whim, and was just blown away by it. Such sweet neutral pinks are generally crowd pleasers and are particularly popular in Asia where the youthful school girl look is always highly sought after, but it is not my style as they can look a bit washed out on me. What I loved about this new blush mix is that I can customize how bold a look I wish by either concentrating my brush on the darker or lighter shades. The lightest shade has a pearl finish with very soft shimmers that create a lovely luminosity when mixed in with the other shades or may be used on its own as a highlighter. 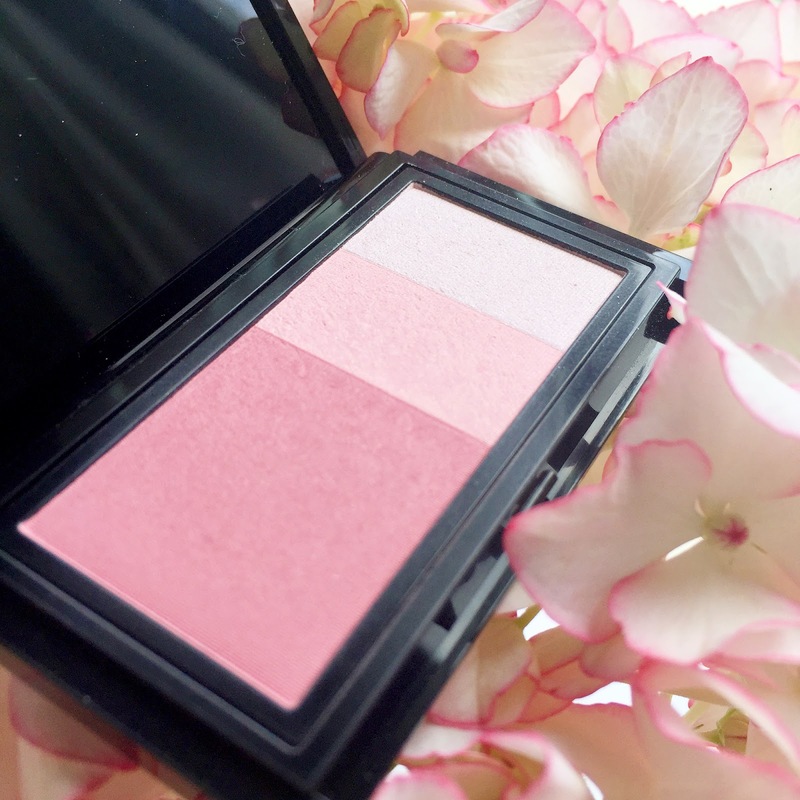 Unlike many other high-end Japanese blushes that give very sheer color, this Addiction Blush Mix is nicely pigmented, super soft and blends out easily. One of my favorite new product launches this season is Shu Uemura’s Laque Supreme. These are, hands-down, the best re-invention of lip lacquers I have ever encountered. They are super pigmented, glossy, and yet completely light-weight and non-sticky! Extremely long-lasting on my lips, and they leave behind a stain even after they’re gone. These Laque Supremes are also a very easy way to achieve the ombre lip look that is still very popular in Asia. Simply swipe the color over the inner part of the lips, smack them together to spread, and then dab gently with a finger to diffuse the color to the edge! Super easy and it lasts! And finally, assembling all of these on my face! I hope you’ve enjoyed today’s post, and maybe I’ve managed to pique your interest in some of the lovely things & trends from Asia. If you’d like to see more, feel free to join me over at my blog or on Instagram! Are there any products or trends that you are loving at the moment? I couldn't yet bring myself trying out the Dior powder. Thanks so much for your guest post and great picks. I love this look, Linda :-) And I completely agree with you - luminous skin, minimal eye makeup and maybe brighter lips. I like my smokey eyes, so I do that quite often, but lately, I've only been wearing liquid liner. I tested the Dior powder in store today and I was so tempted but I vowed to use up my powders before buying more. I guess none for me. What a delight to see you on Sara's blog this morning :-) You're one of my favorite bloggers, Linda. You're charming, personable, and your beauty esthetic is in keeping with my own and so I truly enjoy your reviews and lovely "looks". I am always attracted to the elegant Asian exclusive spring collections and this year was no different. For the most part, they work beautifully with my coloring and I love the more refined approach to color especially since I'm an older (70) woman. I absolutely love the color nuance of an artfully blended Tissé Rhapsodie. Although my eye shape is completely different from yours, seeing what you did with the quad back in February was inspiration enough to have me searching online for the collection :-) I simply couldn't wait for it to be available at Nordstrom. As for Addiction, how I wish it were readily available in the US! When I was in Tokyo last summer, I was like a kid in a candy shop, scooping up beautiful products from brands that are difficult, if not impossible, to come by here. Hi Eileen, thank you so much for your sweetness all the time! I'm so glad to know that the things I recommend are equally relevant to you as to me. As for Addiction, I believe you can get it online from CDJapan, Ichibankao or Cherrycosmetics, or there are a number of personal buyers who may be able to help you for a fee. Thank you, that Chanel Quad is a beauty indeed! Glad you enjoyed the picks, Susan. Sorry to hear the Dior Asia powders are so hard to come by, I really wished things were more easily available worldwide!! But there may still be a chance for this one as it should be out in the US in the summer! Thank you Lily. :* I do like smoky eyes too... I used to only wear liquid liner when I was younger, but these days I just feel naked. As for that Dior powder.... DONT WAIT ANYMORE!!! I totally understand, when I was living in the US during my teenage years, I was always matched to foundations that were 2-3 shades darker than my actual skin tone, and so for many years I always thought I was quite dark. I hope you'll be able to get a hold of that Dior powder, and those Shu laque supremes are permanent and available online. The way you rock your monolids, Sunny... that's definitely Asian! LOL! In fact, I think that was the first post I ever read from you. And yes, BB creams definitely count! Yes you're so right about how our trends are exactly opposite when it comes to foundation matching. And I have a feeling Sara will join you in that rant... ;) As I mentioned to Alison above, I used to get matched to foundations 2-3 shades darker than my skin tone when I was living in the US. Yes I think Tisse Rhapsodie would work well in Spring as well as Winter... it's one of those classic combos - pink/purple/black. Love to see a plummy eye look from you! I am eavesdropping your conversation with Linda, hope that is ok. I would like to ask, are there are products you picked up in Tokyo that you are loving at the moment? I will appreciate a few tips. Greetings from the candy shop. On a side note to what Linda wrote, I also order Addiction from Ichibankao and very happy with the service . Excellent, well-written and interesting post Linda!! 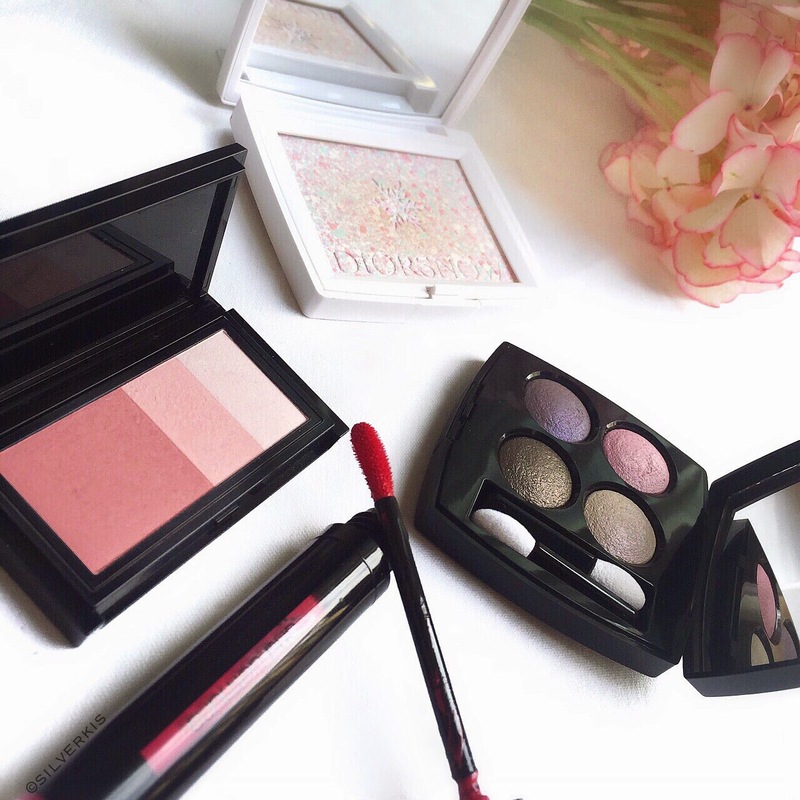 I'm dying to try the Diorsnow powder it looks gorgeous! Wonderful post! I love your blog and have been following since I found you for the first time! Your photos are to die for and you've done an amazing job with the post, I want all the things you've mentioned!! Great article! thank you for showing your favorites! It's really nice to get to know some of Sara's friends und take a sneak peek into their makeup bags. Let's see, here are some of the standouts I got: I purchased the special summer and fall collections from Three, Suqqu, and Addiction as well as Addiction's beautiful 5th Anniversary Palette. I also got things from brands that we have in the US but that are "Asian Exclusives"--things like Guerlain's Météorites Aquarella and some beautiful gift sets from SKII and Clé de Peau. I also picked up a lot of individual products like Three's outstanding Flash Pencil Eyeliners and various other products from different brands. I looked at Les Merveilleuses de Ladurée, but couldn't get past the too cutesy packaging. I bought my very first Addiction eyeshadows from Ichibankao, but between the rediculous markup and shipping charges to the US, it made for an extremely expensive purchase. Since I live in the Los Angeles vicinity, I have easy access to an incredible variety of outstanding brands and so I'm just not willing to pay exorbitant prices for items that are being purchased blind. I'd really love to see Addiction and possibly Three come to the US, though. I think they'd do very well here. Hi Katherine, sorry to hear you can't use any of the Guerlain powders... they do have very strong fragrance :( The Dior one should work better in that case since it doesn't smell quite as strongly. As for the Shu Uemura laque supremes, they are available on the US website!! Thank you so much for your kind words! I'm glad you enjoyed. All the best with landing that Dior powder! Thank you Ingrid, both for your sweet words here and for following my blog! As an equally discerning blogger yourself, I'm so glad to see we love the same things! Thank you dear! I'm afraid I may have started a terrible yearning for yet another unicorn.... lol! Hope you manage to land one! Hi Eleni, glad you enjoyed the post! Actually, I do believe Selfridges stock some amazing Japanese brands that are hard to get elsewhere (apart from Japan)... like SUQQU! I've not tried the Lancome cushion which I've heard so much about, but there are certainly many out there to experiment with, and my personal favorite is from Laneige. You can probably order them online, but shade matching might be tricky. Let me know if you need any help! Oh, awesome! I will check out the Dior powder and the Shu Uemura lacquers, always on the look out for long-lasting lipsticks that are comfy to wear! Yes, you are absolutely right! We can get Suqqu and Shu Uemura as well as, of course, Shiseido. Still, I am not sure we are as exposed to Asian products and trend as the US are? Oh, Laneige... I have been thinking about this BB fusion from sometime now but I am not sure how I can match my shade the right way without trying it on. I'm normally a 020 in Dior, any suggestions you might have would be welcome, sure :)! I am Dior 20, Check out my Laneige Post. I believe Laneige 21 should be fine with you as well. It is a great match for me. Thanks Sara - I will have a look at this then :)!